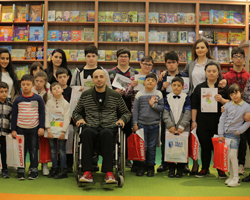 To mark World Down Syndrome Day (WDSD) 2019, the WHO Country Office in Azerbaijan organized a story time for a group of children from the Centre for Rehabilitation of People with Down Syndrome. During the event, WHO staff joined writer Orkhan Adigozal in reading his book “Desires without barriers” to the children. The writer has a disability himself, having lost his ability to walk as a result of an accident at the age of 19. His book shares the important message that individuals with physical or intellectual disabilities should not be isolated from society. They have much to contribute and their desires are not limited by their disabilities. Following the story time, the children participated in a colouring activity and they received books as gifts from the WHO Country Office and Three Apples Children’s Literature section of TEAS Press, a publishing house that supported the event. World Down Syndrome Day is a global awareness initiative that has been backed by the United Nations since 2012. It is observed on 21 March every year. The date itself has been selected for a specific reason – it is held on the 21st day of the 3rd month, referencing the triplication of the 21st chromosome, which leads to Down syndrome. The theme of WDSD 2019 is “Leave No One Behind”, in keeping with the United Nation’s 2030 Agenda for Sustainable Development. All people with Down syndrome should have opportunities to live fulfilling lives and should be included in all aspects of society on a full and equal basis with others. WHO calls on the world to leave no one behind, including those with Down syndrome.